On March 9, four distinguished alumni from the University of Missouri College of Arts and Science were honored during the College’s annual banquet. Honorees represented the division of biological sciences and the departments of romance languages, literatures, art and history. In its 32nd year, the distinguished alumni awards recognized alumni whose professional contributions have enhanced their respective disciplines and the lives of others, while also reflecting well on the University of Missouri’s College of Arts and Science. The Arts and Science Distinguished Service Award was also given at the banquet. “These award winners have accomplished great things since their time at MU, and we are honored to be able to recognize their achievements,” said Michael J. O’Brien, dean of the college. In addition to the distinguished alumni and service awards, officials from the college recognized top academic advisers, teaching assistants and faculty with Blue, Green and Purple Chalk awards, respectively. The Blue Chalk Awards for outstanding advisers were presented to Lindsey Hagglund, academic adviser in the Department of Political Science, and Jenny Morton, senior academic advisor in the Department of History. The Green Chalk Awards for outstanding teaching assistants were presented to Jill Hartleip, teaching assistant in the Department of Religious Studies, and Nelson Danilo Leon, teaching assistant in the Department of Romance Languages and Literature. The winners of the Purple Chalk Awards for outstanding teaching included Peter Markie, professor of philosophy, Silvia Jurisson, professor of chemistry and radiology, and Michael Podgursky, professor of economics. use in areas, like sub-Saharan Africa, where vitamin A deficiency affects millions of people. Award, the Presidential Early Career Award and the Arthur S. Flemming Award. Buckler helps set research direction as an adviser to various panels for the U.S. National Academies, the Royal Society, USDA-ARS, the Howard Hughes Medical Institute, USDA-NRI, the United Nation’s Food and Agriculture Organization, the National Science Foundation, and the European Union’s Scientific Framework. A native Missourian, Sabra Tull Meyer has been creating bronze sculptures for more than 30 years, and she has continued to study with nationally recognized sculptors. Meyer’s work can be seen in important sites across Missouri. She created the Lewis & Clark Monument in the Capitol Complex in Jefferson City; a bust of Bob Barker, one of eight, for the Hall of Famous Missourians; and the 56-foot-long sculptural mural for the Missouri Theatre in Columbia. On the MU campus, her sculptures are located near the School of Journalism, the School of Veterinary Medicine, the Christopher S. Bond Life Sciences Center, the Museum of Art and Archaeology, and the Audrey Walton Track and Field Stadium. In addition to numerous public locations, many of her bronze sculptures are held in private collections and include human figures, small to heroic in scale, wildlife, portrait busts, and memorial plaques. Meyer served on the faculty at Stephens College, in Columbia, Mo., and at William Woods University, in Fulton, Mo. Meyer is a member of the National Sculpture Society, the Oklahoma Sculpture Society, Museum Associates, the Columbia Art League, and the Missouri State Historical Society. Meyer was a founding member of the National Museum of Women in the Arts, Washington, D.C., and is listed in its archives. She is a past member of the MU Griffiths Society and has served on the house board of Kappa Kappa Gamma for more than 30 years. 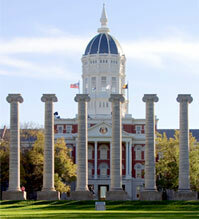 In 2009 she received a Faculty–Alumni Award from the Mizzou Alumni Association. Mustard has a long relationship with Columbia and Boone County. She is a native and has family roots here back to the 1820s. In 1965, she graduated Phi Beta Kappa from MU, and she worked for more than 40 years in social service. She recently retired after serving as the executive director of the Voluntary Action Center for the past 20 years. She has been married for more than 40 years to Marvin, and they have a daughter, Katherine Conley Mustard, who is a film producer. Mustard has been involved in many aspects of the community including Rotary, the Assistance League of Mid Missouri Auxiliary, First Presbyterian Church, the Office of Cultural Affairs, the Missouri Arts Council, King’s Daughters, the Chamber of Commerce education committee, Chamber Ambassador, MU Pride of Place, the MU Chancellor’s Historical Preservation, the MU School of Social Work, and the Women’s Network. She serves on the board of directors for the Missouri Symphony Society, the Mizzou Botanic Gardens, Junior Achievement, Columbia Cemetery, RSVP, and Community Foundation of Central Missouri. Tribune, Spirit of Martha from the MU Griffiths Leadership Society for Women, Columbia Public School Hall of Leaders, “Mustard House” named on the third floor of MU’s Excellence Dormitory, Elks Citizen of the Year, and other recognition from her peers and organizations. Robert serves as president of Renaissance Française–USA, a national delegation charged by Renaissance Française in France with the mission of encouraging appreciation of the French language and culture, principally through the awarding of medals as established in France in 1916. In addition to remaining active with various local groups and boards, Robert served as national president of the Federation of Alliances Françaises USA, from 2001 to 2006, followed by the presidency of Saint Louis-Lyon Sister Cities Inc. from 2006 to 2009. She also served as president of the Alliance Française de St. Louis from 1999 to 2003. Robert is a founder and current board member of St. Louis Language Immersion Schools in St. Louis, with target languages of French, Spanish, and Mandarin Chinese. Most recently, she and her husband, Bruce, sponsored the first permanent chair at Webster University in St. Louis: The Jane and Bruce Robert Chair of French and Francophone Studies. Robert received her bachelor’s degree in French language and literature from Webster University in 1969 and her Diplôme de langue et de civilization from la Sorbonne in Paris in 1968. Her career included teaching French at all levels from elementary through university, as well as sponsoring many student exchanges and other educational activities. The Federation of Alliances Françaises USA selected Robert to receive The Charbonnier Award in 2006 for her active national role. The City of St. Louis and St. Louis County, as well as Webster University, have honored her for active leadership in St. Louis, including naming her Global Ambassador by the World Trade Center–St. Louis in 2008. In 2011, the French government recognized Robert with a knighthood promotion to Officier dans l’Ordre des Palmes Académiques. In 2011, Renaissance Française of Paris awarded Robert and her husband La Médaille d’Or de la Renaissance Française for long-term contributions to French language and culture. In 2007, the French government awarded Robert its highest distinction: the French Legion of Honor. The Roberts have a grown son, Patrick, who is married to Julie Mounts, all living in St. Louis. Flora is retired from Flora & Associates, a firm specializing in health-care consultation and management that he launched in 1982. In 1989, he worked with a group of physicians to launch the Mid-America Kidney Stone Association, LLC (MAKSA) mobile lithotripsy service. Flora was inducted into the inaugural class of Mizzou Engineering’s IMSE Hall of Fame in 2008, and he was given a Missouri Honor Award in 2010 and a Faculty–Alumni Award in 2011. He has served in various capacities for the Mizzou Alumni Association, the Kansas Chapter Mizzou Alumni Association, the Jefferson Club Board of Trustees, and the Chancellor’s Fund for Excellence. In 2009, Flora was presented with a U.S. Secretary of Defense Employer Support Freedom Award, which honors employers for supporting their staff members during deployment. One of only 15 employers nationally recognized, he was personally congratulated by President Barack Obama.